I had been a late bloomer to the Wet n Wild eyeshadow hype but have been redeeming myself over the past year. However, I had been focusing my attention on the 8-pan palettes and neglecting the other eyeshadow offerings. My local drugstore had a buy one-get one 50% off sale, and I decided that was the perfect time to pick up a couple of single shades. I chose Panther and Nutty as they are my quintessential everyday shadows, a matte black and a satin taupe, respectively. I tend to go for palettes when purchasing eyeshadows, from any brand, as it is more bang for your buck and so convenient for traveling as well as everyday use. However, I noticed that sometimes I just want that one black from this palette or that one lid colour from that. Taking out additional palettes takes time in the morning and space in my make-up bag. 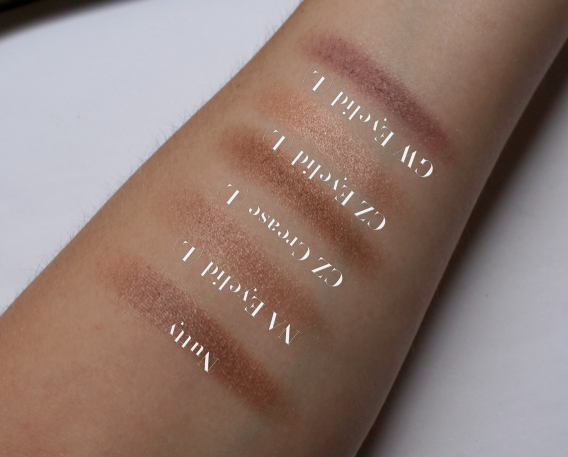 These shadows both have great pigmentation and texture. Nutty has a beautiful sheen, and Panther is absolutely matte, perfect for setting eyeliner. Nutty is a bit more buttery in texture which is typical when comparing this type of finish to a matte. Even though these shades are a bargain at $1.99 each, I thought it would be useful to compare them to other shades I had in my collection. 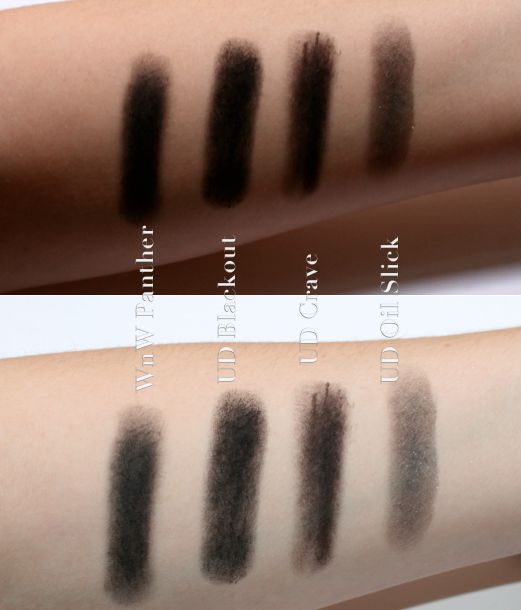 Below is Wet n Wild (WnW) Panther compared to Urban Decay (UD) Blackout (Naked 2 & available separately), UD Crave (Naked Basics), and UD Oil Slick (Naked 1 & available separately). All are matte except Oil Slick which has glitter. Top photo, without flash; bottom photo, with flash. 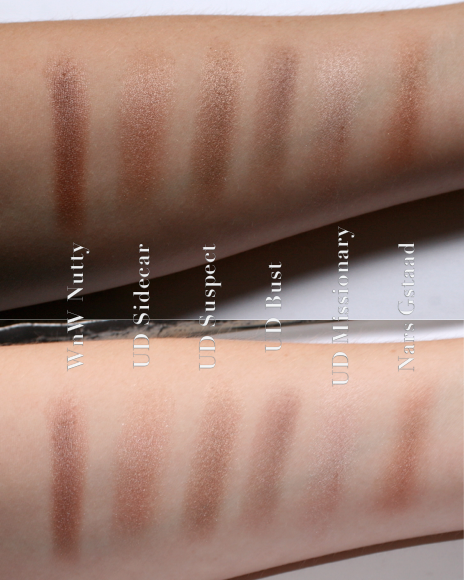 Next, we have WnW Nutty compared to UD Sidecar (Naked 1 & available separately), UD Suspect (Naked 2 & available separately), UD Bust (Book of Shadows Vol. IV & available separately), UD Missionary (Book of Shadows Vol. IV), and Nars Gstaad (The Happening). Hope that might have helped if you were considering purchasing these or other eyeshadows mentioned, even if that is not the case, it's always fun to look at pretty eyeshadows! I am constantly impressed with WnW. As you can tell by my comparisons, I am a huge Urban Decay eyeshadow fan and for years, would pretty much exclusively purchase eyeshadow from them. It's nice to be able to branch out while saving some money. What are some of your favourite Wet n Wild eyeshadows?